We are expecting some disruption in the Forum Library tomorrow (Monday 8th July 2013) while some essential maintenance is carried out on our toilet facilities. We are expecting the temporary closure of the Ladies and Gents toilets in the central block by the PC Cluster on all 3 floors of the Forum Library while maintenance is undertaken during the morning (from 08.30 onwards). During this period please use alternative facilities available on Level 0 (towards the rear stairwell) or across in the Forum. There is likely also to be some noise disruption while the work is being undertaken. 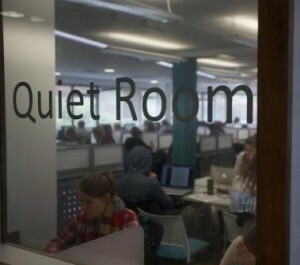 Library staff will be on hand to direct you to quieter study spaces that should be unaffected such as the Lasok Law Library, Learning Hub rooms or the Amory Study Centre. We apologise for any inconvenience caused by this essential maintenance. We hope the work will completed within a few hours but please do ask Library staff if you need any additional support during this time. This entry was posted in Forum Library and tagged noise notice on 7th Jul, 2013 by reg206.